Pop'n Stage is a dancing game based around the Pop'n Music series of games from Konami. 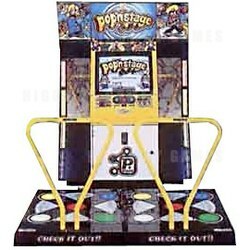 It is a combination of Pop'n Music and Dance Dance Revolution, using Pop'n-style graphics with DDR-style gameplay. The game has a bright, colourful interface and machine design, and is easy compared to most other Bemani games. Includes both 6-switch and 10-switch modes.